Blue is a very shy Golden Retriever mix. He is in training right now with Pets ABC to work out some of his fear issues. He never bites in fear, he just retreats and hides. He is working on confidence and learning how to relax. He had only one owner his whole life (4 years) and never went outside or met strangers. He is about 55lbs. of very sweet dog. He has a twin brother, King, who is his spirit and image. King is not yet ready for adoption, but Blue is working on it. 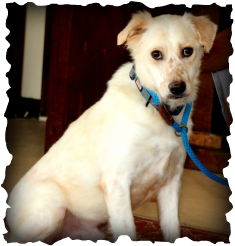 A shy, timid dog who would enjoy a quiet, comfortable home with no kids or too much excitement. A retired couple would be perfect! Contact us to meet Blue. I would like to meet Blue!